Note: This report has an added a feature that lets you easily see associated documents. When the text refers to an event (e.g., a death) for which an associated document is available, a link will be provided to that document. If you see a word or words in blue text and underlined, click on it to see the document. For example, in the third paragraph you will see "He die﻿d in La Coyota". Click on "died" to see the death record. To return to the main report, simply click the back arrow (usually in the upper left of your computer screen). Jesus Garcia was born in Mexico in 1870, the son of Jesus Garcia and Maria de la Luz Herrera. He married Mariana Oliveres (a) February 13, 1888 in Jesus Nazareno Temple in Ojinaga, Chihuahua, Mexico. Mariana was born in Mexico in 1874 and was the daughter of Jose Oliveres and Canuta Ramirez and the great granddaughter of Marcos Ramirez. For more information on the Ramirez family, see http://www.lifebeforetheruins.com/marcos-ramirez.html . In 1898 Jesus and Mariana and their first six children immigrated to the United States and by 1899 they had settled in the village of La Coyota, along the Rio Grande River about two miles west of Castolon, Texas. Jesus, son Pedro (age 12) and daughter Canuta (age 11) all were shown as “ranch laborers” in the 1900 census. Most of the village of La Coyota was built around the eastern base of a mesa, but the Garcia home was on top of the mesa. It was alone there until just after the 1934 flood, when Ruperto Chavarria also built a house on the mesa top. One room of the Garcia home was large enough for an alter and was used for worship services by members of the community. Today nothing remains of the house except traces of the foundations. Jesus engaged in farming, selling his excess produce to the La Harmonia Company in Castolon and probably to the mining communities in Terlingua and Study Butte. He also raised some sheep and goats, sold fuel wood to the mining companies, and hauled freight for local companies, including the Mex-Tex Wax Company (b). In the late 1920’s Jesus moved his family to Terlingua, but returned to La Coyota by 1930. He die﻿d in La Coyota January 6, 1934 and is buried in the La Coyota Cemetery. Mariana was living with son Victoriano in Alpine in March 1940. Jesus and Mariana had thirteen children: 1. Pedro, 2. Canuta, 3. ﻿Carlota﻿, 4. José, 5. ﻿Victoriano﻿, 6. Toribio, 7. Matilde, 8. Tiburcio, 9. Placida, 10. Juan, 11. Domingo, 12. Beta, 13. Inez. 1. Son Pedro Garcia was born in Mexico in 1888 and immigrated with his family to the United States in 1898. In 1917 he sold 9 cords of fuel wood to the Study Butte Mining Company for $48.75 and in January 1919 he worked briefly as a miner for the same company. He worked 21.5 shifts in the mine at $1.00 per shift. No additional information is available on Pedro. 2. Daughter Canuta Garcia was born in Mexico in 1889 and immigrated with her family to the United States in 1898. She married Florencio Rodriguez in Terlingua January 11, 1909. They were married by Father Brocardus from St. Joseph’s Catholic Church in Fort Davis. Florencio was born in 1875 in Mexico (c), the son of Margarito Rodriguez and Lucia Marquez. Canuta and Florencio remained in La Coyota until after the birth of their first child in 1910. They then moved to Alpine for a short time, then to Marathon. Florencio was the owner and operator of a barber shop in Marathon from 1919 until his death in 1936, and Canuta remained in Marathon until her death. Florencio died of bladder cancer in Marathon October 6, 1936. Canuta died of a stroke in Brewster Memorial Hospital in Alpine April 14, 1972. Both are buried in the Marathon Cemetery. (1). Daughter Alicia Rodriguez was born November 14, 1946 in Brewster County. In February 2000 she was living in Alpine. Her married name is Brito. (2). Daughter Corina Rodriguez was born January 22, 1950 in Brewster County. In February 2000 she was living in Crystal City, Texas. Her married name is Milan. (3). Daughter Esperanza Rodriguez was living in Alpine in February 2000. Her married name is De La O. (4). Daughter Viola Rodriguez was living in Fresno, California in February 2000. Her married name is Hernandez. (5). Son Joe Flores was living in Alpine in February 2000. (6). Son Enrique Flores was living in Midland in February 2000. B. Daughter Mauricia Rodriguez was born September 22, 1911 in Brewster County. In 1930 she was living with her parents in Marathon. She married Pablo Fierro in Brewster County July 20, 1931; and they had eight children. (1). Daughter Aida Fierro was born in Brewster County September 29, 1931. She married Florencio Herrera and in September 1988 they were living in Pecos. (2). Son Timoteo Fierro was born January 24, 1934 in Brewster County. He married Mary Madrid and in September 1988 they were living in San Antonio. (3). Son Enrique “Henry” Fierro was born July 8, 1936 in Brewster County. was buried in the Marathon Cemetery the same day. (4). Daughter Olivia Fierro was born November 2, 1938 in Alpine. She married Hilario Celaya, son of Frederico Macias Celaya and Maria Santiago. Delong and Hall. Hilario died in M.D. Anderson Hospital, Houston January 29, 1963. Olivia died September 30, 1988 in Brewster Memorial Hospital, Alpine. Both are buried in Marathon Cemetery. Olivia and Hilario had eight children. a. Daughter Amelia Celaya was born in Brewster County July 20, 1955. In September 1988 she was living in Anacoco, Louisiana. He married name is Martin. b. Son Hilario Celaya, Jr. was born in Brewster County July 1, 1957. In September 1988 he was living in Pecos. c. Son Alfredo Celaya was born in Brewster County July 9, 1958. In September 1988 he was living in Clute, Texas. d. Daughter Diana Celaya was born in Brewster County October 1, 1960. Her married name is De La O and in September 1988 she was living in Fort Stockton. e. Daughter Irma Celaya was living in Fort Stockton in September 1988. Her married name is Vargas. f. Daughter Paula Lynn Celaya was living in Marathon in September 1988. Her married name is Fierro. g. Daughter Regina Celaya was living in Marathon in September 1988. Her married name is Garcia. h. Son Noel Celaya was living in Marathon in September 1988. (5). Daughter Maria Catarina Fierro was born in Brewster County November 25, 1944. (6). Daughter Mary Kay Fierro married Arturo Romero. They were living in Dallas in September 1988. (7). Son Reymundo Fierro married Grace Garcia. They were living in Fort Stockton in September 1988. (8). Daughter Florencia Fierro was living in Houston in September 1988. C. Daughter Juana Rodriguez was born in Marathon May 8, 1913.
and is buried in the Marathon Cemetery. D. Child Santos Rodriguez, born November 8, 1914, died in childhood, date unavailable. E. Daughter Dionicia Rodriguez was born April 8, 1916 in Marathon. She married Margarito Monclova March 19, 1936 in Marathon and they had five children. F. Daughter Felicita Rodriguez was born November 20, 1917 in Marathon. She married Raymond Adolfo Ogas August 18, 1937 in Brewster County. In September 2004 they were living in Dallas. Raymond died in Dallas June 21, 1910. (1) Raymond Adolfo Rodriguez, Jr. was born in Brewster County September 11, 1937. He died in Mesquite, Dallas County, Texas October 2, 2005. (2) Daughter Elizabeth Kay Ogas was born July 15, 1945 in Dallas. G. Son Justino Rodriguez was born September 20, 1919 in Marathon. He married Eliza Rodriguez May 17, 1947 in Brewster County. In September 2004 they were living in Alamosa, Colorado. (1) Daughter Raquel R. Rodriguez was born in Brewster County October 28, 1947. (2) Daughter Rebecca Rodriguez was born in Brewster County November 2, 1949. H. Daughter Geromina Rodriguez was born September 30, 1921 in Marathon. She married Crispin Ortiz July 12, 1949 in Brewster County. In September 2004 they were living in Fort Stockton. I. Daughter Basilia Rodriguez was born June 14, 1923 in Marathon. She married Rafael Mancha September 13,1952.
the son of Rafael Calderon Mancha and Ana Viesca. He died October 2, 1957 when the truck he was driving rolled over and crushed him. He is buried in the Marathon Cemetery. (1) Son Zaul Mancha was born April 14, 1953 in Brewster County. (2) Daughter Juana Edwiges Mancha was born August 1, 1956 in Brewster County. J. Son Guillermo Rodriguez was born February 10, 1925 in Marathon. Guillermo served in the U.S. Navy during World War II. He died in Marathon June 28, 1989 and is buried in the Marathon Cemetery. K. Daughter Claudia Rodriguez was born June 6, 1927 in Marathon. She married Gilberto Flores and in September 2004 they were living in Marathon. L. Daughter Lucia Rodriguez was born April 7, 1930 in Marathon. She married Edwardo Salmon in Brewster County February 10, 1949. He was the son of Juan Soto Salmon and Anita Briceno. (1) Son Carmen Rodriguez was born June 29, 1949 in Brewster County. (2) Son Eduardo Salmon, Jr. was born July 12, 1951 in Brewster County. (3) Son Samuel Rodriguez Salmon was born October 8, 1956 in Brewster County. (4) Son Leonel Rodriguez Salmon was born October 6, 1959 in Brewster County. 3. Daughter Carlota Garcia was born in Mexico in 1890 and immigrated to the United States with her family in 1898. She was living with the family in La Coyota in 1910. Circa 1913 she married Sabino Estorga, born circa 1890 in Mexico. He was the son of Susano and Teresa Estorga. In 1910 he was living with his parents in Marathon and was working as a laborer in the rubber factory. Soon afterward he moved to the Terlingua area, where he met Carlota. By 1920 they had moved to Ward County where Sabino was working as a farmer along Pyote-Grandfalls Road. By 1930 they were living in La Coyota, where Sabino was working as a freight wagon driver. They remained there until at least 1932, then returned to Ward County, where Sabino worked as a laborer in the cotton industry. On June 18, 1940 he died from injuries suffered in an automobile accident on Crane Highway and is buried in the Barstow Cemetery. Carlota apparently preceded him in death, but details are not available. A. Daughter Ignacia Estorga was born circa 1914 in Texas. in April 1930 she was living with her parents in La Coyota. B. Daughter Martina Estorga was born circa 1915 in Texas. 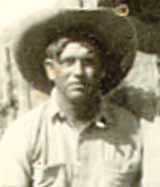 Pyote-Grandfalls Road in Ward County and in April 1930 he was living with his parents in La Coyota. He was a student at the Castolon School during the 1932-1933 school year. (1) Son Sabino Estorga was born in Ward County March 8, 1948. He died in Ward County March 9, 1999. (2) Son Ruben Estorga was born April 1, 1949 in Monahans. He married Delia Hernandez Vargas January 23, 1967 in Ward County. a. Daughter Priscilla Estorga was born October 4, 1967 in Ward County. (3) Daughter Elva Carrasco Estorga was born February 21, 1951 in Ward County. (4) Son Eduardo Estorga was born February 6, 1954 in Ward County. (5) Son Daniel Estorga was born was born February 16, 1955 in Ward County. (6) Son Roy Carrasco Estorga was born September 12, 1961 in Ward County. 4. Son José García was born in 1891 in Mexico and immigrated to the United States with his parents in 1898. Between September 1916 and July 1918 he sold nearly 97 cords of fuel wood to the Study Butte Mining Company for $703.10. In January 1917 he sold timbers and mine stulls to the same company for $89.70, and in September and October 1917 he hauled over six tons of freight for the company for $66.21. He probably moved his family from La Coyota to Terlingua in the late 1920’s, but returned to La Coyota by 1930. A. Daughter Elisa García was born in Terlingua April 10, 1926. B. Daughter Paula García was born in Terlingua January 26, 1928. C. Son José García was born May 29, 1929. He﻿﻿﻿ died December 26, 1932 and probably is buried in the ﻿La Coyota﻿ Cemetery (d). D. Daughter Socorro García was born November 14, 1933, probably in La Coyota. E. Son Jesús García was born December 25, 1935, probably in La Coyota. 5. Son Victoriano Garcia was born in Mexico in 1896 (e). He immigrated with the family to the United States in 1898. In 1916 and 1917 he sold 9.5 cords of fuel wood to the Study Butte Mining Company for $53.25 and in April 1921 he probably was working in some capacity with the Chisos Mining Company. He married Tomasa Campos January 15, 1919. She was the daughter of Agustin Campos and Pilar Martinez and was born March 7, 1901 in Presidio. In 1930 Victoriano and Tomasa moved to Alpine where Victoriano worked in road construction. They were living in Alpine in March 1940. Victoriano died of a heart attack in Alpine April 20. 1962 and Tomasa died of cardiac arrest in Brewster County Memorial Hospital August 27, 1966. They are buried next to each other in Holy Angels Cemetery. A. Daughter Jania Garcia was born circa 1920 in Texas and in 1930 was living with her parents in Alpine. (1). Son Johnny Garcia Cordova was born December 20, 1942 in Brewster County. In September 1997 he and his wife Mary were living In Del Rio, Texas. (2). Son Alfredo Leonel Cordova was born October 20, 1946 in Brewster County. In September 1997 he and his wife Cynthia were living in Midland. (3). Son Edmundo Cordova was born February 18, 1949 in Alpine. He died in Alpine of a coronary embolism February 22, 1953 and is buried in Alpine. (1). Son Orlando Sandate was born in Brewster County May 19, 1947. His wife’s name is Linda and in October 2003 they were living in Baytown, Texas. (2). Son Victor Joel Sandate was living in Los Fresnos, Texas in October 2003. His wife’s name is Terry. D. Son Manuel Garcia was born February 22, 1924 in Texas and in 1930 and 1940 he was living with his parents in Alpine. He was living in Fort Worth in October 2003 and died there October 24, 2005. (1). Daughter Isela Garcia was born in Midland October 25, 1965. She married Neto Mejia. (2). Son Hector Lorea Garcia was born July 1, 1965 in Midland. His wife’s name is Sonia. (3). Daughter Maria Garcia was born May 3, 1968 in Midland. She married Ruperto Perez, Jr.
(4). Daughter Alejandra Garcia married Jonathan Arellano. (1) Daughter Diamantina Dominguez was born January 4, 1951 in Brewster County. Her married name is Espinoza and in December 2012 she was living in Alpine. a. Daughter Maritza Renee Dominguez was born in Brewster County July 27, 1980.
b. Daughter Ariana Marie Dominguez was born in Brewster County May 18, 1984.
a. Son David Thomas M. Dominguez was born September 6, 1983 in Brewster County. b. Daughter Doraliza Molinar Dominguez was born January 3, 1985 in Brewster County. a. Daughter Andrea Marie Portillo was born in Brewster County September 23, 1993.
b. Daughter Amber Michelle Portillo was born in Brewster County April 3, 1996. G. Son Reynaldo Garcia was born July 8, 1931 in Alpine. In March 1940 he was living with his parents in Alpine. He died in Alpine October 30, 1993 and is buried in Holy Angels Cemetery. H. Daughter Esmeriguilda “Celia” Garcia was born April 13. 1934 in Alpine. In March 1904 she was living with her parents in Alpine. She died of cardiac arrest following surgery in University of Texas Medical Branch Hospital, Galveston June 9, 1961 and is buried in Candelaria Cemetery in Midland. Her married name was Ramos. I. Daughter Maria Garcia was born in Alpine June 6, 1936 and was living there with her parents in March 1940. J. Daughter Carolina Garcia was born in Alpine March 9, 1939 and was living there with her parents in March 1940. She married Atilano Otto Tellez August 24, 1963 in Brewster County and in December 2012 they were living in Flagstaff, Arizona. (1) Son Larry Ramsey Lara was born April 29, 1957 in Brewster County. (2) Daughter Lanelle Martha G. Lara was born May 21, 1959 in Brewster County. (3) Son Lonnie Robert Lara was born October 24, 1960 in Brewster County. (4) Daughter Lorinda Ann Lara was born February 5, 1963 in Brewster County. (5) Daughter Lu Ernestine Garcia Lara was born March 10, 1965 in Brewster County. 6. Son Toribio Garcia was born in Texas April 16, 1899. He was baptized in Terlingua May 19, 1900 by Father Brocardus. His godparents were Marciano Quintela and Mauricia Chavarria. In 1919 Toribio sold 9.5 cords of fuel wood to the Study Butte Mining Company for $55.60. In May 1940 he was living in La Coyota with his sistere Placida. According to the 1940 census, he earned $400.00 in 1939. He died in Alpine February 16, 1934 and is buried in Alpine. 7. Son Matilde Garcia was born in La Coyota May 20, 1901. He was baptized in Terlingua by Father Brocardus. His godparents were Simon Acosta and Marcelina Chavarria. In June and July 1917 he worked a total of 22 shifts as miner for the Study Butte Mining Company for $1.00 per shift. Later in life he worked as a ranch hand for various ranchers in the area, including Wayne Cartledge and Homer Wilson. He married Teodora Granado January 6, 1928. She was born in San Vicente, Texas July 27, 1906, the daughter of Sostenes Granado and Trinidad Sanchez. She was baptized February 24, 1907 in San Vicente by Father Brocardus. Her godparents were Camilo Celaya and his wife, Ignacia Macias. (For more information on the Granado family, please see http://www.lifebeforetheruins.com/balbino-granado.html). Matilde died in Marathon April 6, 1982. A small marker on his grave reads “El Vaquero de los Chisos” (The cowboy of the Chisos). Teodora, “Ma Lola” as she was known later in life, died November 2, 2004. They are buried next to each other in the Marathon Cemetery. 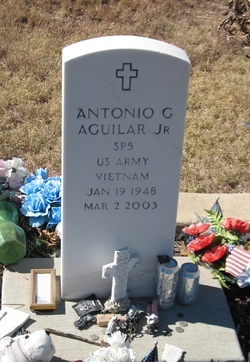 (1) Son Antonio Aguilar, Jr. was born in Marathon January 16, 1948. He was a Vietnam Veteran. He died in a motorcycle accident on US 385 about 12 miles south of Marathon March 2, 2003. He was employed by Big Bend National Park as a mechanic and welder at the time of his death. Antonio, Jr. is buried in the Marathon Cemetery. a. Daughter Zenja Lynn Aguilar was born March 13, 1971 in Brewster County. She married Brian Archuleta. b. Daughter Blanca Aguilar was born January 27, 1975 in Brewster County. c. Daughter Toni Andriana Aguilar was born February 15, 1981 in Brewster County. a. Daughter Toni Dennette Gonzales was born August 31, 1979 in Lubbock. (3) Daughter Lorissa Aguilar was born March 8, 1956 in Brewster County. She married Guadalupe Gonzales and in August 2012 they were living in Clint. a. Son Raymond Anthony Bewley was born September 8, 1991 in Odessa. b. Son David Lee Bewley was born June 25, 1996 in Odessa. He died in Odessa June 9, 2010. Jo Ella later married Michael Smart and in August 2012 they were living in Odessa. a. Daughter Ciara Ranae McCormack was born December 21, 1995 in Odessa. B. Son Benigno Garcia was born October 11, 1932. He died December 11, 1932. His place of birth, death and burial probably was La Coyota. (The record shows Castolon, which was the post office of La Coyota at the time). C. Daughter Cruz Guadalupe Garcia was born May 3, 1934 in Terlingua. She died in UMC Hospital, Lubbock August 2, 2007 and is buried in the Marathon Cemetery. Her longtime companion was Jesse Barriga. 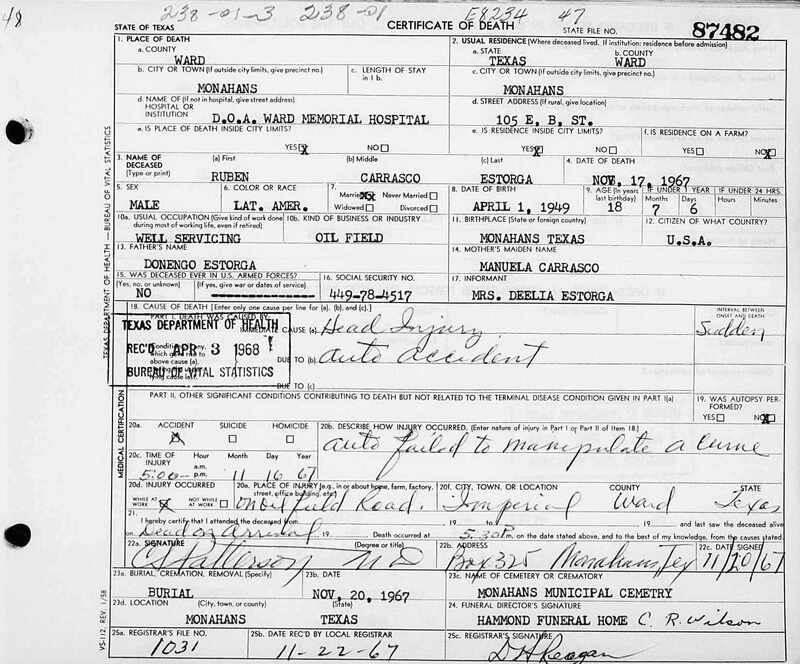 D. Son Jesus Garcia was born January 19, 1940 in Brewster County. In August 2012 he was living in Monahans. E. Son Alfredo Garcia was born January 10, 1943 in La Coyota. He died in Study Butte August 16, 1945 and is buried in Terlingua. F. Son Porfirio Garcia was born February 26, 1945 in Brewster County. In August 2012 he was living in Monahans. (1) Dora Garcia Terrazas was born March 6, 1947 in Marathon. She died as the result of a tragic accident February 17, 1951. Children at play accidently ignited combustible material. She had 3rd degree burns over 95% of her body and died in the Alpine Clinic. She is buried in the Marathon Cemetery. (2) Son Alfredo “Freddy” Terrazas was born March 30, 1948 in Brewster County. In January 2012 he was living in Taylor, Texas. (3) Son Gregorio “Greg” Terrazas was born May 31, 1950 in Brewster County. He was living in Shertz, Texas in September 1997. (4) Son Esmundo Terrazas was born January 19, 1955 in Brewster County. He was living in Monahans in September 1997. (6) Daughter Juanita “Janie” Terrazas was born February 4, 1962. She was living in Odessa in September 1997. Her married name was Ahaway. H. Daughter Dominga "Minga" Garcia married Sixto Aguilar in Brewster County May 10, 1954. In August 2012 they were living in Marathon. They had three children. (1) Daughter Gilda Maria Aguilar was born December 13, 1955 in Brewster County. (2) Son Sixto Aguilar, Jr. was born October 14, 1957 in Ward County. (3) Daughter Roxana Garcia Aguilar was born June 6, 1959 in Brewster County. 8. Son Tiburcio Garcia was born August 11, 1903 in La Coyota. He was baptized in Terlingua October 18, 1903 by Father Brocardus. His godparents were Sixto Chavarria and his wife, Maria Hinojos. On August 22, 1926 Tiburcio married Merced Silvas. This was a double wedding with Merced’s sister Petronila and Tiburcio’s second cousin Francisco Ramirez, who also lived in La Coyota. The wedding occurred at the Steele Ranch (f), about two miles west of La Coyota. The ceremony was performed by Father Julius Gremaud from St. Agnes Catholic Church in Terlingua. Merced and Petronila were the daughters of Leandro Silvis and Maria Deanda of Castolon. See http://www.lifebeforetheruins.com/leandro-silvas.html for more information of the Silvas family. For a wedding gift, Tiburcio and Merced received four freight wagons from Merced’s parents. This undoubtedly helped get Tiburcio started as a freighter. In the last half of 1927, he hauled freight for the La Harmonia Company in Castolon, He made seven round trips to Alpine during this period, earning a total of $317.45. It normally took 10 to 14 days to make the round trip. Tiburcio was still working as a freight wagon driver in 1930, according to the census, but there are no indications that he worked for La Harmonia Company after 1927. In the early 1930’s trucks began replacing mule-drawn wagons for hauling freight, which apparently forced Tiburcio to seek other employment. In 1936 he moved his family from La Coyota to Study Butte to work in the mines, in 1938 he moved to Alpine to work on a ranch, and soon afterward he moved to Marathon, where he worked as a section hand on the railroad. He also worked for Big Bend National Park around 1950, eventually retiring from the National Park Service. Merced died in Alpine September 13, 1997 and Tiburcio died October 20, 1987. They both are buried in the Marathon Cemetery. A. Daughter Elvira Garcia was born May 28, 1927 in La Coyota. She married Secundino Baeza Ramos June 4, 1950. He was born July 1, 1926. Secundino was a World War II Army Veteran and a Purple Heart recipient. He worked for Big Bend National Park, where he was the Roads and Trails Foreman. He died June 4, 2002. Elvira died May 29, 2009 in Edmond, Oklahoma. B. Son Ysidro Garcia was born May 15, 1929 in La Coyota. He attended school in Castolon, Study Butte, Terlingua and Marathon. In 1936 he moved with his family from La Coyota to Study Butte, In 1938 he moved with his family to Alpine, and soon afterward to Marathon. While in Marathon he worked for the W.R. Green Store stocking shelves and cleaning, and in 1947 he went to work for Big Bend National Park. Ysidro married Margarita Ornelas May 26, 1956. She was born in Presidio October 6, 1927, the daughter of Juan Ornelas and Francisca Carrasco. Ysidro and Margarita made their home in Presidio, where Margarita served as the Postmaster. Ysidro ranched and farmed about seven miles upriver from Presidio, where he grew cotton and hay. Ysidro was a U.S. Marine Corps Veteran with service in Korea. Ysidro died in a traffic accident near Sotol Vista, in Big Bend National Park, on June 12, 1980 and is buried in the Marathon Cemetery. (1) Daughter Viola Irene Garcia was born in Marfa August 27, 1957. (2) Daughter Merced Garcia was born November 5, 1958 in Marfa. (3) Son Ysidro Garcia, Jr. was born April 24, 1962 in Fort Davis. (4) Son Ricardo O. Garcia was born in Alpine August 27, 1966. He married Elida Alvarez. C. Son Domingo Garcia was born in Terlingua October 20, 1935. He died in Terlingua February 4, 1937 of bronchial pneumonia and is buried in the Terlingua Cemetery. D. Daughter Isabel Garcia was still born in Terlingua July 8, 1938. She probably is buried in Terlingua Cemetery. E. Son Guadalupe Garcia was born May 16, 1940 in Marathon. He married Refugia Mimbela and in 2011 they were living in San Antonio. F. Daughter Carmel Lucia Garcia was born February 16, 1945. She was born a deaf mute. In 2011 she was living with Elva Ramos Diaz in Edmond, Oklahoma. G. Son Roberto Garcia was born November 4, 1951 in Marathon, the twin of Esperanza. He died there of pneumonia April 17, 1952 and is buried in the Marathon Cemetery. H. Daughter Esperanza Garcia was born November 4, 1951 in Marathon, the twin of Roberto. She was born with Down’s Syndrome and lived with her brother and guardian, Ezequiel Garcia in El Paso. She died in 2011. I. Son Agustin Garcia married Salome Ramos and in 2011 they were living in El Paso. He is the owner of Coronado Prime Meats. Agustin is a U.S. Military Veteran. J. Son Ezequiel Garcia was born in Marathon. His wife’s name is Lorina and in 2011 they were living in El Paso. He was the guardian for his sister, Esperanza, who died in 2011. Ezequiel is a U.S. Military Veteran. 9. Daughter Placida Garcia was born in La Coyota October 5, 1905. She was baptized in Terlingua by Father Brocardus April 21, 1906. Her godparents were Severiano Chavarria and his wife, Rita Ramirez. She married Marcelo Dominguez October 3, 1925, probably in Terlingua. They were married by Father Julius Gremaud from St. Agnes Catholic Church in Terlingua and their witnesses were Francisco Ramirez and his sister, Andrea Ramirez, from La Coyota. Marcelo was born in July 1902 in Presidio, Texas, the son of Patricio Dominguez and Herlinda Olivas. In January 1929 Placida and Marcelo were living in the Lajitas area, but by March 1930 they had moved to Castolon. Marcelo worked as a ranch hand on cattle ranches in both areas. By May 1940 Marcelo was deceased and Placida was living in La Coyota with their children. Placida died in San Jose, California September 18, 1993. A. Son Nicolas Dominguez was born in Terlingua October 3, 1925. He was living with his mother in La Coyota in May 1940. B. Son Julian Dominguez was born in Lajitas January 28, 1929. C. Daughter Eniberta Dominguez was born in Castolon 16 March 1930. She was living in La Coyota with her mother in May 1940. D. Son Marcelo Dominguez, Jr. was born in Castolon 10 April 1933. E. Adopted Son Arturo (Moreno) Dominguez was born in 1939. 10. Son Juan Garcia was born December 27, 1907 in La Coyota. He was baptized in Terlingua May 3, 1908 by Father Brocardus. His godparents were Severiano Chavarria and his wife, Rita Ramirez. 11. Son Domingo Garcia was born in La Coyota December 20, 1909. He was baptized by Father Brocardus in Chisos April 26, 1910. His godparents were Manuel and Luisa Lujan. In 1930 he was working as a carpenter’s helper and living in Alpine with his brother Victoriano. He died in 1984 and is buried in Holy Angels Cemetery. (1) Daughter Silvia Acosta was born October 12, 1958 in Monahans. (2) Son Abel Acosta was born in Monahans July 2, 1960 and was living there in November 1967. He died November 16, 1967 of a gunshot wound to the head when he and another boy were playing with a gun and it accidently discharged. He is buried in Monahans Municipal Cemetery. (3) Daughter Jeanette Acosta was born September 26, 1963 in Monahans. (4) Daughter Christina Acosta was born October 29, 1965 in Monahans. (5) Son Raul Acosta was born March 25, 1968 in Monahans. (6) Son Robert Renee Acosta was born February 11, 1969 in Monahans. (7) Daughter Brenda Ann Acosta was born March 16, 1971 in Monahans. (8) Daughter Sulema Acosta was born July 19, 1979 in Winkler County. (1) Son Eddie Mark Almanza was born July 11, 1965 in Monahans. He was a resident of Kermit when he died of Cancer April 16, 1976. He is buried in the Monahans Cemetery. (2) Son Rodney Lee Almanza was born in Monahans May 18, 1967. (3) Daughter Pricilla Marie Almanza was born in Kermit September 15, 1980. (1) Son Luis Edward Orosco was born in Monahans November 5, 1962. He died as a baby. (2) Daughter Lori Orosco was born in Monahans. (3) Daughter Caroline Orosco was born in Monahans July 23, 1964. (4) Son Tommy Lee Orosco was born in Monahans March 8, 1966. (5) Daughter Elisa Orosco, twin of Jose Luis, was born in Monahans September 4, 1968. (6) Son Jose Luis Orosco, twin of Elisa, was born in Monahans September 4, 1968. (7) Daughter Annette Orosco, twin of Jennette, was born in Winkler County July 1, 1975. (8) Daughter Jennette Orosco, twin of Annette, was born in Winkler County July 1, 1975. D. Son Leonel Almanza was born September 16, 1953 in Monahans. He died at his home in Monahans November 27, 1959 and is buried In the Monahans Memorial Cemetery. (1) Daughter Kari Lynn Almanza was born June 5, 1981. (2) Daughter Kimberly Angela Almanza was born May 31, 1985. (3) Son Kenneth Joshua Almanza was born October 25, 1988. (4) Daughter Kellie Michelle Almanza was born November 5, 1990. B. Daughter Dominga Garcia was born February 9, 1941 in Alpine. She died of burns in Fort Stockton February 3, 1945 and is buried in Fort Stockton. C. Son Juan Garcia was born August 30, 1944 in Brewster County. D. Daughter Loria Garcia was born November 15, 1945 in Brewster County. E. Son Ricardo Garcia was born February 7, 1947 in Brewster County. F. Daughter Elida Garcia was born December 24, 1947 in Brewster County. (a). This name also appears as Oliver and Olivas. (b). The Mex-Tex Wax Company operated a Candelilla wax plant and company store at Cerro Chino in the early 1920’s. (c). Florencio’s obituary indicates he was born in Barcelona, Spain. 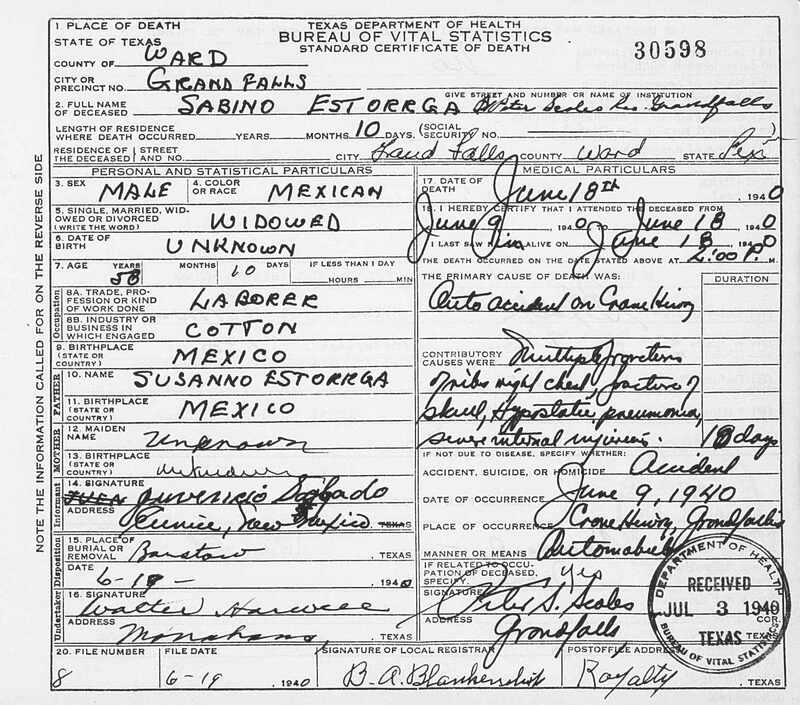 However, his death record and census records all indicate he was born in Mexico. (d). In the death record the burial place is shown as Castolon, which was the post office for La Coyota at that time. (e). Birth date 12 January 1900 in death record and on cemetery marker, but he was four years old in the 1900 census. (f). At the time of the wedding, the property was actually owned by James Sublett. Many local residents remembered it as the Steele Ranch because Leonides Steele lived there when they first arrived in the area. Brewster County, Texas, tax records. Brewster County census records for 1900, 1910, 1920 and 1930. La Harmonia Company general ledgers, Wayne Cartledge Collection, Archives of the Big Bend, Sul Ross State University, Alpine, Texas. Marriage records for St. Joseph’s Catholic Church in Fort Davis, copies held by The Archives of the Big Bend, Sul Ross State University, Alpine, Texas. Personal observations by the author. Big Bend National Park Oral History Program, interview with Isidro Garcia, October 24, 1979. Big Bend National Park Oral History Program, interview with Cornelio Ramirez, March 1, 2005. Elva Ramos Diaz family history research. This page was last updated April 10. 2015 by Antonio S. Franco with information from Jose E. Garcia. 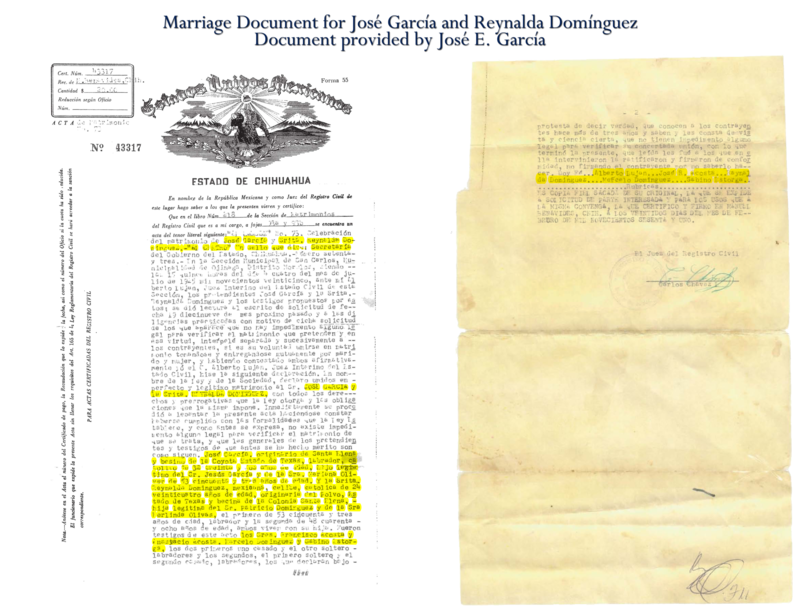 We also linked the marriage certificate for his grandmother Reynalda Dominguez which Jose E. Garcia provided. There was also minor layout editing for readability. We added same-page-links to the names of the thirteen children Jesus and Mariana had to make it easier to go to that section of the page.